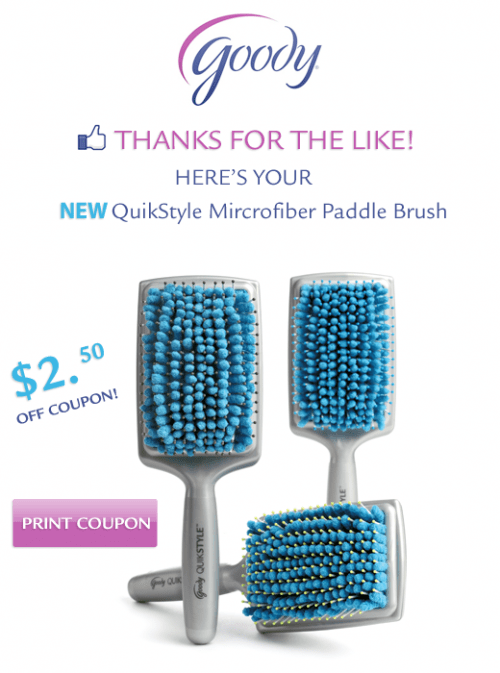 Click here to print your coupon for $2.50 off the purchase of a Goody Quickstyle Microfibre Paddle Brush. So basically it’s a brush with little towel-like nubs on it? Like a carwash glove, for your head? What’s the use for this? Is it to dry your hair or clean it? I have very very thick hair and this is a wonderful invention for people like me. Towel drying and blow drying are damaging to the hair. Microfiber will absorb water in no time. Thank you to AnneDougherty! Thanks minifi, does the coupon have a set expiry on it?